I certainly relate to the title of this blog. It is one of the many reasons that I participate in this activity and shy away from public speaking. Verbal expression is sometimes awkward, uncomfortable or stilted, but the words often flow when I put fingers to keyboard. This is also true for some of our children. I was hanging out with some of my favorite adoptive mom friends, and one began to share how she was trying an experiment with her sons. She had found some old composition notebooks around the house, and she was going to begin a back and forth dialogue with them in written form. This resonated with me and offered a flash of hope as I considered one of our daughters in particular. Words are sometimes not plentiful for her – not at all a problem for her sister – and I sometimes struggle with how to connect on a deeper level. I KNOW there are a lot of thoughts, ideas, and feelings swirling around inside of her, but to express them is sometimes a challenge. 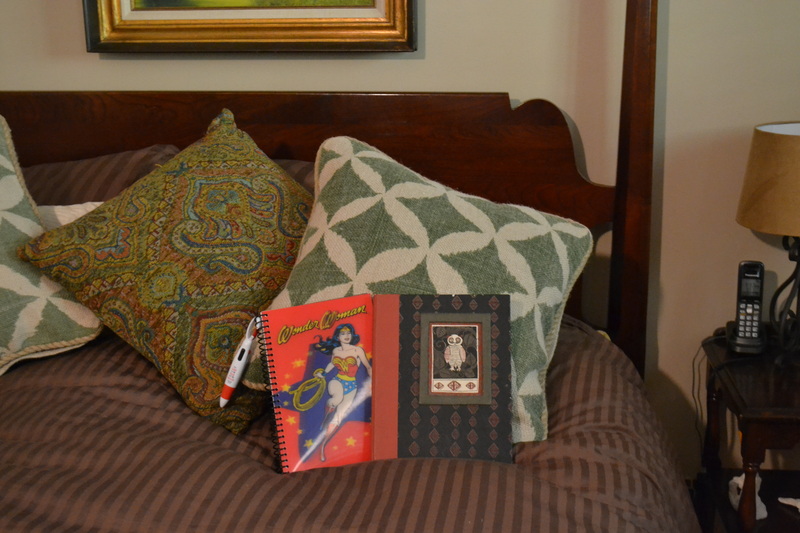 So, I rounded up a few cool journals (see picture – one daughter is into books and study, the other into super heroes) around our home, presented the idea to our girls and we began a back and forth kind of sharing diary. We have been doing this for about eight months now, and it has been a hit, particularly with our more introverted and quiet child. She truly is more in her element when writing. This practice has given me one more avenue to offer words of encouragement during joyous, anxious or challenging times. Back and forth journaling has helped me more fully live out some of the suggestions in my last blog on seeing the strength behind a troublesome behavior. I just last night wrote to each of them their own personal #10 strength or character trait as we’ve been on a “10 things I love about you” theme. Taking the time to be deliberate with penned words has made this a powerful exercise and increased my awareness of just what makes these two so incredibly special. At times when emotions have been overwhelming, it has been a safe place for our quieter girl to express words that had a difficult time coming out of the mouth. Sometimes we write back and forth several times a week and sometimes much less frequently. We place this mother/daughter exchange on each other’s pillow. They genuinely get excited when they see their special journal on their bed. And when I come up tired at the end of the day and have a hand written note from one of my girls, it is such a gift and a joy. I cherish these exchanges and hope to be reading and writing them for years to come. She herself lived in a neglectful home until 15 months, bounced around to several foster homes and then landed in an ill prepared adoptive home at age 7 ½ years of age. Many years later, she is a therapist and focuses on working with adopted and foster children. So, whenever I get a chance to hear or read her perspective, I jump at it. Jeanette Yoffe has much to impart to adoptive families. Her gentle voice said, “if a child is defensive, easily criticized, highly sensitive to the threat of rejection and hard to redirect”, then she knows there is excessive shame underneath. Some adoptees carry the deep feeling that there is something terribly wrong with them as a person – after all, one set of parents has chosen not to parent them, and children certainly don’t have the ability to look at this from a nuanced point of view. This powerful statement by Yoffe clearly communicates how some foster and adopted children feel – “when they make a mistake, they feel like a mistake.” That is where some of our children reside. But the point of this talk was not to wallow and hang out in the shame place. It was a call to adoptive parents in the midst of some of the most challenging times to become strength detectors. Rather than look at much of the disruptive behaviors as manipulative, controlling, attention grabbing, she challenged us to recognize the strengths that underlie the frustrating behaviors. For example, for the child who always wants to win and losing can turn into a tantrum, recognize the trait of determination. For the one who gets into fights when a friend is wronged, acknowledge the loyalty and justice behind that. The list of possibilities is endless. Yoffe stated that when we can first give credence to the strength that underlies the behavior, then we can gently address more adaptive ways to express these strengths. No, it is not ok to tantrum and attack. But when we adjust our lens to see and point out the underlying character strengths first, then there is a more open heart to receive the suggestions on more appropriate means of expression. In parenting all children, it is often easier to hone in on the negatives, the deficiencies, the problems rather than take a step back and delight and speak of the positives, the strengths, the amazing things about our children. It takes a level of intentionality to train ourselves to really see the gifts and positive character traits (not achievements) of our kids. Thanks to Jeanette Yoffe, I am on a mission to see the positives and point that out before gently addressing the behavior changes needed. It is a joy and delight to see my child stand a little taller and smile a little brighter as I acknowledge her incredible strengths – a true shame buster. When there is an issue in the adoption world that is getting ready to rumble up to the surface and explode, my first clue almost always comes on facebook. That happened yesterday as the recent NBC investigative series on adoption explored the nefarious practice they term “re-homing” children outside of any law. The stories are gut wrenching and heart breaking as internationally adopted children are basically posted and traded on the Internet within the USA. My initial and appropriate reaction was one of deep sadness for the children and disgust for the adults participating. I also thought, “here we go again – another story that makes adoption look horrible”. Yet on further reflection, I believe that this story could lead to more honest and open talk about the highly complex decisions that confront a family when a child with serious behaviors enters in. Here is an attempt to explore that side of the story. The technical word for when an adoption is dissolved is disruption. If the things that I read and know of are any indication, this is on the rise. My heart and mind almost always first empathize with the child involved in these stories. The pain and suffering that is being acted out within the family context is immeasurable. Traumatized children don’t become a physical threat to themselves and others by happenstance. There is always a very difficult and often dark backstory. And though sometimes these children have words for what has happened to them, often it is pre-verbal and they only have behaviors to express the depth of pain and suffering in their lives. Children are exposed to drugs and alcohol in utero and this almost always harms the brain, learning abilities, emotional maturity and behaviors of a child for life. Yet each and every one of these abused and neglected children, whether coming to a home after foster care in the US or from a country somewhere across the globe, desperately needs a safe and loving place to land. Ask any social worker – there aren’t a lot of “qualified” people lining up to do the job. Sometimes the troublesome behaviors and issues are known, communicated, prepared for and the parents embark on a committed relationship with all of the needed support systems in place. But I think this is a rarity. Child welfare workers are often desperate to place children and know if they tell the whole story, it won’t happen. Full disclosure needs to happen, as it is the best hope for a child to get what they need to heal as fully as possible. And often, there is no way to know or predict how complex any one child’s needs will turn out to be. Just as with many biological children, they unfold in time. Many open hearted people go into adopting children from hard places with great intentions and an expectation that this child will fit right into the family. Depending on many factors (ex. parenting style, child resiliency, parent resiliency, temperaments, resources to name just a few) that may or may not happen. Social workers have an obligation to fully educate and support adoptive parents. Adoptive parents have a responsibility to be educated on and as prepared as possible for “worst case scenarios”. But the truth is that if we as a parent truly believed that the worst case would become reality, we probably wouldn’t take the risk. Imagine if you adopted a hurting child into your family and then this child became a physical threat to other children in your home. Or if you found that they had sexually abused another child in your home. These things are happening. Sometimes when all needs are visible and known, the best hope for an individual child is to be an only child or placed with parents highly trained in therapeutic parenting. Some situations are highly complex and have to take multiple perspectives with no clear best path. This is a far different decision than the ones being made in the NBC series. It is a universe away from posting a child on the Internet, an open invitation to any and all sexual predators, and dropping them off in an unknown place. There is another aspect to this story. I want to say this gently to any reader who is already actively parenting a great number of children from hard places. Dr. Karyn Purvis of TCU who does research based interventions for at-risk children has begun to speak powerfully and directly about the incredible amount of family energy and resources needed to parent many of these children. Her advice is to adopt no more than two and to adopt them several years apart (our family busted on that one!). We must be realistic and count the cost. It is very difficult for those who see the need and the long lines of children needing a home but the short lines of parents prepared to walk alongside them. And while it may not be two children, there is definitely a tipping point in each of our families and we need to be honest and realistic about such things. I have a lot of friends and acquaintances that have struggled on a much more deep and profound level than our family – friends who have paid a very high price to parent their precious, hurting children. Family, friends and faith communities have often grown weary or judgmental and turned their backs on them. Some have made the painful decision to let their children more fully heal in residential treatment centers. Some have lost their career or marriage over the stress of parenting deeply injured children. Not to mention the physical, emotional and spiritual toll on them as human beings. They desperately need others to come alongside and help. As a society, we can’t even be remotely ok with that. The NBC families highlighted are extreme cases and in my opinion, the parents have no business parenting hurting children. I have seen this kind of situation up close – it is utterly devastating. But in our rush to judge and be on the moral high ground, sometimes we throw all disruptions into the same category. I can’t even imagine the pain and agony that some have lived through before coming to that decision. Before we categorize all as same, we need to ask some really hard questions of ourselves as a person and as a society. Some situations are extremely complex and heart rending, yet still those parents are the target of disdain and shame. We live in a broken world. We are broken people parenting broken children. Sometimes outrage is appropriate and sometimes a shattered heart and utter compassion are the best response. All adoption nightmares are not the same story. One of the greatest gifts of parenting children from hard places is the invitation, and often a mandatory kind of invite, to enter into real, true and messy humanity. A bit of back story. Some of the traditions from whence I come emphasize a shiny and polished image over dealing with the sometimes raw reality of the human experience. How things look from the outside matter more than what is truly going on inside. I embraced this mindset quite fully and successfully in many areas of life for many years. I knew how to make it all look fairly appealing and adeptly chose the correct mask to wear for any given situation. But there was a price to pay. An empty and hollow inside often welled up as I struggled to figure out who indeed is the real Tricia. What do I really think about x, y or z? As our children have gotten older and as we have been gifted the opportunity to parent in different ways in order to meet the needs of our adopted daughters, the masks are dropping. Sometimes they are removed with a very slow, painful peel and sometimes they almost effortlessly drop to the ground and smash into a million pieces. It is a slow transformation. This very honest, real and vulnerable dwelling place can be highly uncomfortable. I almost feel naked at times. There are times when I feel tempted to just run for cover and duck back into the formerly comfortable place of image and masks. But the truth is I can’t really do that any more. The old habitat has now become the awkward spot. There is pain, sadness and grief at the end of pretending and mask wearing. But the good news is there is tremendous joy, growth and freedom in the world of living authentically and accepting each child, day and moment as it is. Denial and “not looking too closely” took an awful lot of energy. When I am able to live in this open and honest space, each and every person crossing my path can be embraced as a fellow messy human beloved by God – the exact category where I belong. We are each and every one fully human. I don’t have to waste any thought or energy on how they are different or “wrong” or any other alienating adjective I can conjure up. Their masks are at times a bit more apparent, but sometimes rather than reacting with judgment, grace and compassion rise up. After all, I certainly can empathize with the lure of a glittering image and mask wearing. I have always been drawn to spend time with people who are authentic, honest and real yet also live with great faith, hope and love. 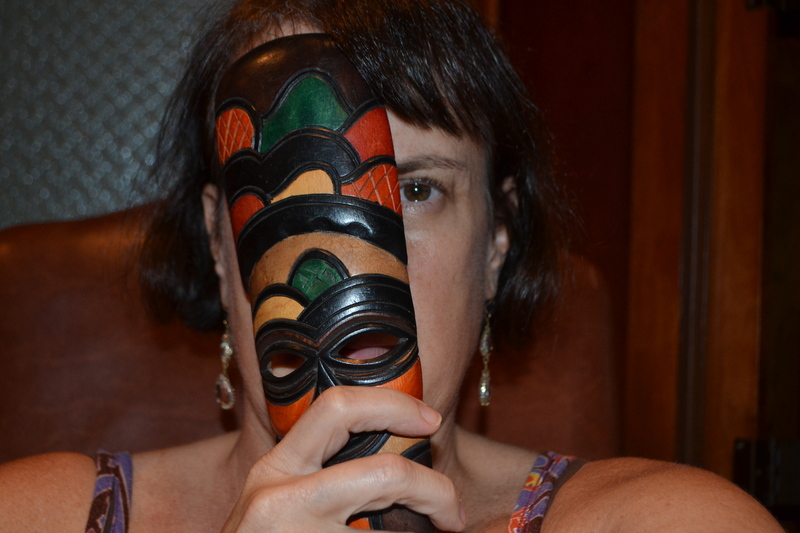 As I continue the dropping of my own masks , I look forward to more honest and open relationships within my family and out into the communities where I walk and live and interact. Though this path is at times difficult, it is also scattered with great freedom, peace and joy – the place I truly want to abide.